Truly, spirals are one of the oldest symbols used by mankind, and some of the oldest geometric shapes in ancient artwork dating back at least to the Neolithic period, created by people thousands of years before writing, or written language! Spirals can represent personal evolution and holistic growth, letting go, surrender, release, Awareness of the ONE within the context of the whole, connectivity and union with deities and cosmic energies, stars and more. Here, I explore spirals as a symbol of spiritual growth through five cards in the Transformation Oracle: Receptivity, Expansion, Recycle, Integration, and Creativity. The first spiral I experienced was in the Creativity card. This card captured my attention and held me in its embrace. 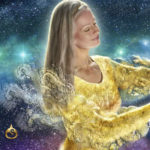 The peace and surety of the Goddess (that is each of us) appearing in All That Is, receiving Divine Inspiration beaming into the gold lotus bowl, is then poured out into the Universe through two spirals: one surrounding the Goddess and the other at her feet. All the colors! Inspired, I looked for more spirals in the Transformation Oracle, and found them. Why spirals? Spirals are signposts, signaling me to pay attention, the Divine is present; slow down and observe, breathe and feel that connection within to All That Is. Isn’t that a great reminder to all of us? Slow down, stop DOING and begin BEING… BEing allows us to re-connect with ourselves, nature, the Infinite and brings me a deep settled knowing that All is Well. The spiral also challenges me to go within to get my answers; go within to find peace; living is a journey, a path of discovery-if I choose awareness. Spirals remind me that life is sacred. A spiral in a Transformation Oracle card is a signal that there is more here than meets the eye, I must activate my inner ‘eye’ and heart to receive and understand the bigger message present, regardless if reading for myself or another. Let’s take a look! See the woman, head tilted towards a singing bowl to better hear, leaning into and being receptive? 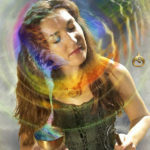 See the spiral forming in the singing bowl, moving up to her ear and then around her in a spiral wave of light? Now, look at her other hand where she holds the ringer, I can see a slow spiral being created. So many layers to this card. As a reader for someone else, you might ask, “Are you listening? What are you hearing? You have the potential to create!” The answer to our prayers can resolve, or appear to us in a number of ways, but we must be receptive and pay attention,being open to the answer, the message, which may come to us through someone else, a song on the radio, a bumper sticker, a passage in something we’re reading, or an overheard conversation meant just for us. 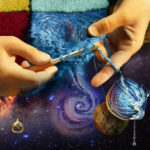 SunSigns mentions that spirals can mean growth and evolution, representing people coming back to the same point in their life, but with new and better kinds of understanding. They can be used to expand, connect, and develop the mind. A spiral could represent a journey, a direction, and progress. The potential I see in the Receptivity Card, with the two spirals, is to have the reader ‘tune in’ to see if there is a need for harmony, or a new path; that this time in life requires a bit more of paying attention and focus, and above all else, a willingness to receive. This card is of the Air element, so the ‘action’ involves the mind, belief systems, ideas, what one holds to be true, and suggests that there may be a shift (present, coming soon, and/or necessary) in those areas. The Western system of five elements is composed of earth, air, fire, water, and quintessence. Quintessence literally means “fifth element,” which is sometimes referred to as spirit. Look at the spirit unfurling in this card! A young woman cradles her womb in her hands, touching this new, as yet, unborn life, connecting. Her world is about to expand, mirroring the expansion of her body, where a new spirit resides. Catherine Beyer stated that because of its connection with mother goddesses, the spiral is sometimes viewed as a feminine symbol, representing a variety of things traditionally associated with women such as life cycles, fertility, childbirth, and intuition. However, most interesting to me was that she also mentioned the “Western system of five elements” which is composed of earth, air, fire, water, and quintessence. Quintessence literally means “fifth element,” which is sometimes referred to as spirit. There is no standard symbol for spirit. Circles are probably the most commonly used symbol for it, but spirals are also sometimes utilized. In the Transformation Oracle Deck spirit is found within the fire element cards. Finding quintessence – the spiral – in the Transformation Oracle Deck brings connection to spirit in a deeper, more meaningful way, and this quintessence is found in one card of each the elements of Air, Fire, Water and Earth. Balance well met! The Expansion card can be a signal to prepare for something new. Readers delve beyond the obvious with this card. This card can be indicating the need to allow room in life for more; we have the capacity to embrace new thoughts, con-cepts, ideas. To break through boundaries, go where no one has gone before! Seek out new life, new information… the Star Trek theme (some truths are never out of date!) beckons us to explore. Be an explorer in the world…stretch into the Universe, expand! Expansion connects! When we choose to expand, to allow ourselves to love more, to learn more and grow, we get closer to the truth of who we are. Dive into the spiral and find your core essence, breathe and expand, connect and resonate with the Universe, and rise up the spiral to a higher consciousness. This card is of the Water element; any action is most likely to take place within oneself; in the heart and the tides of emotion. Remember the womb surrounds the life in fluid. At this point, all is not yet ‘set in stone’ and choices remain fluid, able to change. We create our lives, choosing where to spend our resources: money, time, energy, love and joy. This card is of the Earth element, so clients drawing this card may be considering changes that could affect material wealth, abundance, family, and foundations that their life has been built on. Perhaps there is a consideration to rebuild from the ground up, not necessarily throwing everything away, but re-purposing, re-creating with that which is already present. 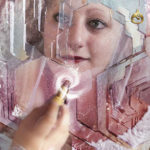 “Mirror, mirror on the wall, who’s the fairest of them all?” Do you see the spiral being drawn with a tube of lipstick? It isn’t really a tube of lipstick, it’s a magic wand! Can you re-imagine yourself anew? As children we bounce into life full of life, love and laughter, which seems to lessen as we grow up and away from believing in ourselves and our inherent beauty-the beauty of being. The Integration card is a signal that it may be time to change focus from ego to BEing (from the mind space into the heart space). Who are you really? Look past the face in the mirror; shift your focus to look inside you and discover who you really are. Do you see the spark of creative spirit in the spiral? Use the wand to illuminate and integrate your greater self fully within the physical you. Be embraced by love. The Integration card is of the Air element, indicating that the work begins within the mind, thoughts, ideas, and perceptions. Clients drawing this card are perhaps ready for higher awareness, for something more- the trick is to go “out of your mind” and the realm of the ego. Shed old perceptions of self. This takes inner work, inner reflection, and presents the reader the opportunity to come closer to Oneness and out of an illusion. See your spirit peeking out, waiting to be welcomed? Welcome! Well come! Old illusions shattered, making way for a new way to BE. I believe this observation by Carl Jung, the famous psychiatrist, to fit right in with the Integration card. He said that as you move into the spiral you are letting go of undesired aspects of your ego and possessions and worry about others percep-tions of you, moving in towards your core self. You have insights into your beliefs and behaviors on this inward journey and move into higher conscious awareness. As you move back out you are growing and connecting to Source Energy of All That IS in a loving, harmonious and collaborative way. Isn’t that perfect for integration?! How I love this card! A double spirit card: the fifth element, quintessence, within a fire (spirit) card, magic! Transcending time and space, the Goddess in gold is smiling and stands in service to the Universe. She never tires, full of Light and Love, she allows creation to flow through her hands. The golden cup, full of the Divine, spills out in a rainbow of color, dropping into a cosmic spiral of creation; a beacon awakening life; a new jewel to adorn the Universe. Remember, there are three spirals in this card: the Divine Inspiration beaming into the gold lotus bowl, which is then poured out into the Universe through two spirals: one surrounding the Goddess and the other at her feet. The third spiral or spiral cluster is in the Goddess’s “wings.” I find it interesting that the spiral is found in structures as small as the double helix of DNA (amazing!) and as large as a galaxy. Our own Milky Way Galaxy is a spiral galaxy! The feeling I resonate with most here is that the spiral symbolizes creation – constant creation, born out of immense love that has no end. The Creativity card is of the Fire element, so readers drawing this card may be seeking the greater meaning of life, looking for something more. Perhaps they are on a spiritual quest, or at the culmination of a spiritual journey. I believe our spirits to be naturally playful and curious, at home in the realm of Joy, where fear is nonexistent. The Creativity card encourages us (have courage!) to feel free to play in creation just to see what happens. Having no judgment on the re-sult can free us to open spiritually to the Divine, and enter the flow of abundance. Catch a ride! See where abundance takes you. Believe and allow no one to dim the light that you are. Creation holds you in a loving embrace. Spirals can symbolize the slow reveal of things that are hidden; show-ing up in the Transformation Oracle cards the spiral indicates a need to look closer with the inner eye. Gina-Dianne Harding, a Higher Consciousness Activator, commented that, “The spiral is the journey of life, and that the path of life resembles a spiral. We seem to pass the same point over and over again but from a different perspective each time.” So I wonder, do we reincarnate until we have seen life, or lived life, from all perspectives? My prayer is that we all learn this lesson of perspectives in this here and now. BEing aware of the cosmic dance with the spiral with each moment of breath. 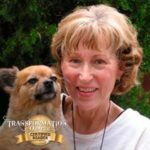 Check out Grandmother Wahseh’s article on Mirrors in the Transformation Oracle.